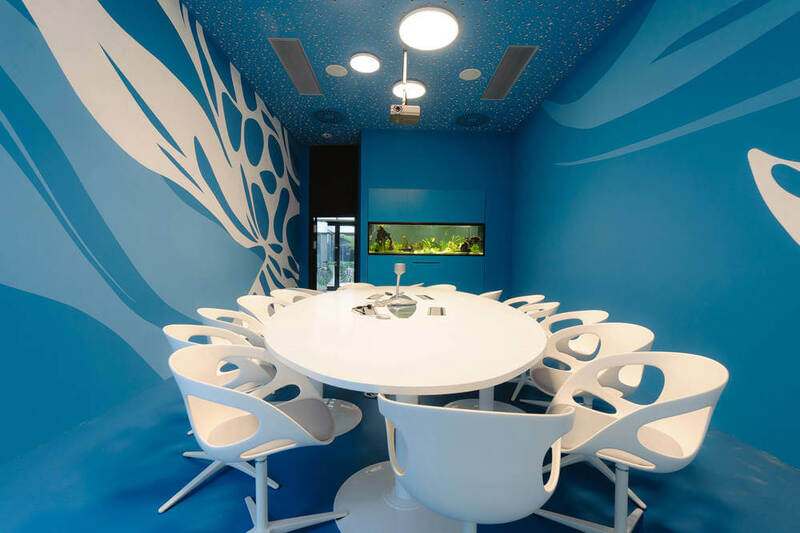 Dynamic, ultra-modern and with a touch of fun, that’s how can be described in a few words the relatively new office design for the Microsoft Headquarters in Vienna, Austria. As you can see in our previous articles Awesome Google Offices Designs Around the World and Creative Modern Design: Facebook Office in Palo Alto, offices of the largest international companies are renowned for their creative and innovative design concepts that inspire, encourage and stimulate people to have better professional results and be more happy. Microsoft, the world’s largest software maker and one of the world’s most valuable companies, seems to make no exception when it comes to its offices, joining the trend in this kind of offices’ design. The competition to design this project for Microsoft Headquarters in Vienna was won by Austrian architects INNOCAD and completed in 14 months, in 2011. Guided by their device: “Work with your brain and act with your heart”, INNOCAD Architektur ZT GmbH manage to create unconventional concepts for every client they have and this one we show you is a great example. They teamed up with the Microsoft project team during the subsequent project realization phase to create a design related to Microsoft’s ‘Workplace Advantage Concept’ which makes “a custom-tailored interior programme” based on the employee structure’s analysis of every branch office. So the design approach of the Austrian architects was carefully tailored to the needs of the 330 people who work there and the result is a transparent and collaborative 4,500 sqm work areas which impresses by a futuristic, fresh and even fun style. The three-storey offices feature amazing meeting rooms designed around three major themes: ‘flow’, ‘nature’ and ‘New York”, which besides the ultra-modern furniture and inspiring style, are also reinforced by direct and indirect lighting with pendant, floor-standing and table luminaires which creates an atmospheric undertone. High-traffic areas connected by striped vinyl flooring by Bolon gives a sense of dynamism, encouraging circulation, whilst each floor has its own green wall of living plants and vegetation, which provides a soft and natural appearance and contrasts very nice with the high-tech working environment, where we’re sure anyone of you dreams to work in such an environment, isn’t it? Find more inspiring details in the pictures below. Cool office. Love the room with walls painted in wavy blue, gorgeous!